The Implacable Inexorably Malignant Shoulds – Love. Life. Practice. 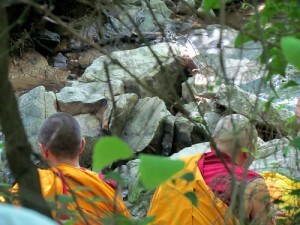 One of my favorite Zen proverbs is about two monks – one old, one young – who are traveling when they come to a river. There is a woman there, distraught because she has no way to cross the river. The older monk graciously offers to carry her across on his back, much to the surprise of the younger monk who has been told that touching women is forbidden to their order. Out of respect for his elder, he holds his tongue, and they all cross the river, the woman jumps off the old man’s back, thanks him, and they go on their way. One way to get rid of the shoulds is to find a place of understanding. The fact is, whether or not someone should or should not have done something is moot; they did do what they did, and they had reasons for doing so. Maybe you can understand those reasons because they can tell you; maybe you have a perspective they don’t, and can see why they did what they did even if they can’t. Or maybe you won’t be able to understand; that’s ok, too, because there’s nothing that says you should. It Is, It Was, It Will Be – How Could It Not? I’m kidding. It’s not easy at all. In fact, I think the closer you are to a situation, the harder it is to let the fact that you might never understand be ok. You run it around and around in your head, trying to figure out how to make it right, how to do better next time. What is this “better” crap, anyway? Better by whose standards? What you can do is the best you can, and let that be alright. The problem with all the “shoulds” is that while they supposedly are there to help you make a better decision next time…they really don’t. There won’t be a next time, because those people in that situation are gone, lost to the passage of time. Sure, there may be similar circumstances that come up in the future, things that at least superficially seem the same, but the reality is that it will be a new you, a new them, and an entirely different world. Fooling yourself into thinking that it’s going to be the same as last time is as crippling as assuming that it’s going to be different. What can you do, then? Well, the answer to what to do in the moment is simple: the best you can. But this is more about getting rid of the “shoulds”, and to do that you have to let go of thinking that they could have done better (they did what they did because that’s what they did). That things could have been different (they couldn’t, because they weren’t). That you could have done better (you did the best you could at the time). That last one is the hardest to handle, I think. But I’d like to think we could let go of some of the “shoulds” of the past year, and maybe take on fewer in the year to come. Understanding is all well and good. But the fact is sometimes you’ll never know. I always find it interesting when people criticize politicians, such as our current President. “He should have done this,” “Why didn’t he do that?” The thing that always strikes me is that it’s pretty obvious that our current President has a fairly difficult situation in terms of passing anything through congress. And if it’s obviously pretty difficult, then the actual level of difficulty – the actual machiavellian back story that we don’t know about – must be horrendous. It’s a miracle anything gets done at all. The same goes for all of us. The real story, the real forces and influences that affect our choices are usually far beyond our own understanding, much less anyone else’s. So there are going to be times when we think we understand, and we can let go, and the fact is we really only have a partial understanding (if that). Sometimes we’re completely wrong, but we can still manage to let go. Those are the lucky times. Other times, you know you don’t understand. You just can’t figure it out. You tear at it in your head, journal about it, kvetch about it to your facebook friends and your hair stylist and even your iPhone (“Siri, WTF?“) and you just can’t figure it out. You still gotta let it go. In fact, it’s even more important that you let go of the things you can’t understand, because otherwise you’re going to use up a lot of energy that could be better used in things that you do understand. The shoulds will come at you in the middle of the night and steal your sleep. They’ll come to you in the middle of a kiss and steal your joy. They’ll come to you in every waking moment of your day and steal your life. Let it go. And move on to something more constructive. Doesn’t sound like much, does it? It’s not. But it’s somewhat better than just mouldering in a big puddle of should, and you know what? That ought to be enough. Thanks Gray. I needed this. Okay, I’ll probably need it again and again and again… but that’s the way life goes right? Thought-provoking post as usual. I’ve seen you make several references to “sitting” in the context of a deliberate practice. If that involves anything apart from the obvious, would you mind explaining the purpose of that? One of my first posts, “How I Sit”, was all about that: http://www.lovelifepractice.com/?p=50 . To sum it up quickly, though, if it could be said to have a “purpose” it’s to try and get to a point of experiencing life as it is – as opposed to how we see it, with all our layered-on attitudes. In reality, it’s usually a parade of self-criticism, worry, fantasies, “shoulds”, and more. By sitting, you can cultivate the practice of observing these thoughts come to you and go away…and somehow, through that observation, they have a little less power over you. It’s a painstaking, gradual process. There are times when I want to scream and throw a punch at a wall rather than sit there with the thoughts that are going through my head. Other times I want to weep. Other times I can’t wait for my little timer to go off so I can get on with the day. But that’s just it: if sitting can inspire all of those different things, then where is it coming from? Myself. So I sit, and gradually learn to not be tossed about on the seas of emotion. (sigh) But it’s a very gradual process. And boring as anything, quite often, especially in this day and age. But I know that on the days I skip it…I miss it. So I always come back to sitting. Thanks for the additional insight! Must have missed that first post somehow. Will definitely go back and read it!